Individually, Gene Stephens, Sammy White and Tom Umphlett featured the record manufacturing. 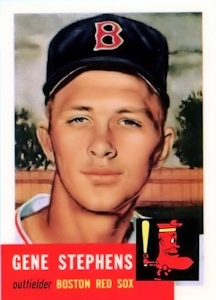 Stephens became the first modern big leaguer to make three hits in the same inning. White scored three runs in the same inning to be the first major leaguer to score that many in an inning since 1900. Stephens, White and Umphlett each reached base safely three times in the historic seventh for another modern mark. Only the Chicago Nationals of 1883 ever surpassed the offensive records made by the Boston club. They scored 18 runs in the seventh inning of their Sept. 6th game in ’83 and by a coincidence it was also against a Detroit team. The Sox of yesterday equaled or broke many of the ’83 Chicago marks. This was a close and hotly contested game for six innings. The Red Sox took a three-run lead off Ned Garver in the second inning. Walt Dropo’s fifth homer with one aboard in the fourth put Detroit back in business. The Tigers tied it at 3-3 at the top of the sixth on a walk to Ray Boone, a surprise sacrifice bunt by clean-up hitter Bob Nieman and a Jim Delsing bunt.